The Battle of Issus occurred in southern Anatolia, on November 5, 333 BC between the Hellenic League led by Alexander the Great and the Achaemenid Empire, led by Darius III, in the second great battle of Alexander's conquest of Asia. The invading Macedonian troops defeated Persia. 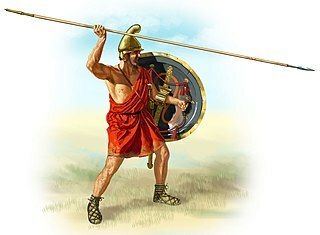 After the Hellenic League soundly defeated the Persian satraps of Asia Minor at the Battle of the Granicus, Darius took personal command of his army. He gathered reinforcements and led his men in a surprise march behind the Hellenic advance to cut their line of supply. This forced Alexander to countermarch, setting the stage for the battle near the mouth of the Pinarus River and the town of Issus. 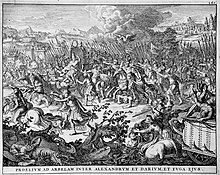 The wars of Alexander the Great were fought by King Alexander III of Macedon, first against the Achaemenid Persian Empire under Darius III, and then against local chieftains and warlords as far east as Punjab, India. Due to the sheer scale of these wars, and the fact that Alexander was generally undefeated in battle, he has been regarded as one of the most successful military commanders of all time. By the time of his death, he had conquered most of the world known to the ancient Greeks. Although being successful as a military commander, he failed to provide any stable alternative to the Achaemenid Empire—his untimely death threw the vast territories he conquered into civil war. 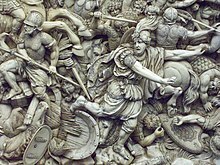 The Battle of the Hydaspes was fought in 326 BC between Alexander the Great and King Porus of the Paurava kingdom on the banks of the river Jhelum in the Punjab region of the Indian subcontinent. 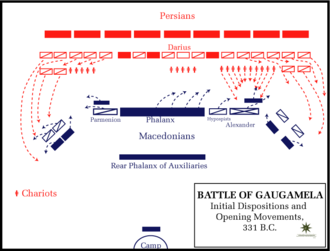 The battle resulted in a Greek victory and the surrender of Porus. Large areas of the Punjab between the Hydaspes (Jhelum) and Hyphasis (Beas) rivers were absorbed into the Alexandrian Empire, and Porus was reinstated as a subordinate ruler. Satibarzanes, a Persian, was satrap of Aria under Darius III, king of Persia. The Battle of Megalopolis was fought in 331 BC between Spartan led forces and Macedonia. Alexander's regent Antipater led the Macedonians to victory over King Agis III. The Battle of the Persian Gate was a military conflict between Achaemenid Persian army, commanded by the satrap of Persis, Ariobarzanes, and the invading Hellenic League, commanded by Alexander the Great. In the winter of 330 BC, Ariobarzanes led a last stand of the outnumbered Persian forces at the Persian Gates near Persepolis, holding the Macedonian army for a month. Alexander eventually found a path to the rear of the Persians from the captured prisoners of war or a local shepherd, eventually capturing Persepolis. Arsames was an Achaemenid Persian satrap of Cilicia in 334/3 BC. He succeeded Mazaeus in this position. He took part in the Battle of Granicus where he fought with his cavalry on the left wing, along with Arsites and Memnon of Rhodes. He was able to survive that battle and flee to the capital of Cilicia Tarsus. There he was planning a scorched-earth policy according to that of Memnon which caused the native Cilician soldiers to abandon their posts. He also decided to burn Tarsus to the ground so as not to fall in the hands of Alexander but was prevented from doing so by the speedy arrival of Parmenion with the light armored units who took the city. After that, Arsames fled to Darius who was at this time in Syria. He was slain at the battle of Issus in 333 BC. Sabaces was an Achaemenid satrap of the Achaemenid Thirty-first Dynasty of Egypt during the reign of king Darius III of Persia. The Mallian Campaign was conducted by Alexander the Great from November 326 to February 325 BC, against the Malli of the Punjab. Alexander was defining the eastern limit of his power by marching down-river along the Hydaspes to the Acesines, but the Malli and the Oxydraci combined to refuse passage through their territory. Alexander sought to prevent their forces meeting, and made a swift campaign against them which successfully pacified the region between the two rivers. Alexander was seriously injured during the course of the campaign, almost losing his life.